ALM HM offer a vast range of complete copper rainwater systems in Natural Copper finish and offer gutter sizes 200, 250, 333, 400 and 500mm. These measurements relate to the total width of the material used and not the gutter size. 200 and 250 are specifically designed for the Domestic Market. This covers anything from a small extension to a medium / large sized house. The gutter joints, corners and running outlets should be soldered together using the appropriate tools and equipment which ALM HM hold in stock. Gutter bracket spacing 400mm to ensure the system copes with potential snow loading / Downpipe brackets 1 per metre. 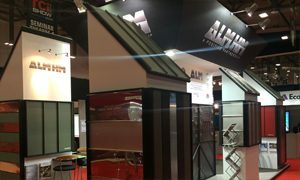 Further to the 200, 250 and 333, ALM HM also offer the 400 AND 500 gutter for large commercial buildings. 120mm downpipes are also available for these systems. ALM HM hold extensive stocks to ensure project deadlines are met. For items not in stock a 2/6 week lead time should be expected depending on the product required.